Rooms from $79.99 per night. Description This Peachtree City, Georgia hotel has an outdoor pool, free internet access, non-smoking guest rooms and free breakfast. This hotel is also pet friendly. Complimentary breakfast a seasonal outdoor pool and rooms equipped with microwaves and refrigerators make the Days Inn and Suites Peachtree City a convenient hub for exploring local sights. The two-story hotel offers 50 rooms including cable TV with HBO microwaves refrigerators coffeemakers free local calls (under 30 minutes) and free high-speed internet access. Wake up on the right side of the bed thanks to the hotel's complimentary breakfast. The seasonal outdoor pool provides a welcome cool down on a hot summer day. The fitness room is open 24 hours for late-night or early-morning workouts. Fax and copy services are available in the business center. Parking is free. Pets are permitted for a nightly free. Non-smoking rooms are available. The hotel is off Highway 74 one-and-a-half miles from events at the Peachtree City Amphitheater. Grab a quick bite to eat at one of the restaurants within walking distance or drive two miles to the Avenue Peachtree City and take your pick of lots of dining and shopping options. Golfers are one mile from Planterra Ridge Golf Club. Braelinn Golf Club is two miles away. The welcoming waters of Lake Peachtree are one-and-a-half miles from the hotel. Hartsfield-Jackson Atlanta International Airport is 24 miles away. 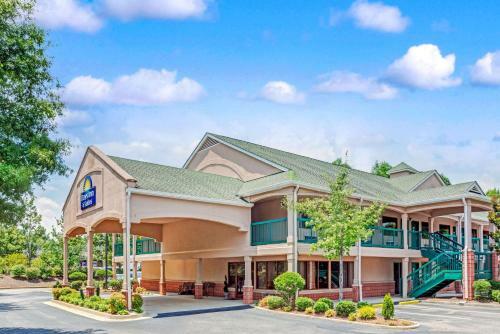 Add Days Inn & Suites By Wyndham Peachtree City to your free online travel itinerary.